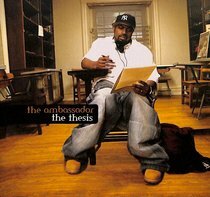 From the Cross Movement Camp comes The Ambassador, dropping his second solo album entitled The Thesis. His commanding voice rides over chunky, funky beats and offers the message of hope in Christ. :From the Cross Movement Camp comes The Ambassador, dropping his second solo album entitled The Thesis. His commanding voice rides over chunky, funky beats and offers the message of hope in Christ. They call him THE AMBASSADOR...The A-M-B-A! Born William "Duce" Branch, he represents what appears to be two clashing cultures-the Kingdom of God and hip hop. THE AMBASSADOR, a founding member of the critically acclaimed group The Cross Movement, stands as a shining example of how hip hop can be properly submitted to God while avoiding the typical corruptions commonly associated with it. This tricky navigation did not develop without a struggle, but God has clearly maneuvered this man who is destined to impact the music industry and the world. Having been raised primarily by his father in New York City, THE AMBASSADOR came of age during the same time as the escalating new influence of the streets-hip hop. He followed the example of the genre's heroes, in both positive and negative ways-writing rhymes that caught the attention of others and provoked the thoughts of his peers but also, unfortunately, falling prey to the urban drama of heavy drug use, petty dealing and sexual promiscuity. By his late teens, the Lord began to unravel the lies of the culture and THE AMBASSADOR found himself empty, losing vital relationships with his family and close friends and challenged with becoming a teenage father. But that pain ignited the spirit of the maturing artist, instilling in him an appetite to impact the hip hop culture with a refueled faith. Making his mark in music with a groundbreaking debut solo album Christology: In Laymen's Terms, THE AMBASSADOR began delivering intense scripturally rooted lyrics set in poetic, dynamic flow. He has toured globally both as a solo artist and with The Cross Movement, and he has been covered by Christian and mainstream media outlets as diverse as Time Magazine, CCM Magazine, VIBE, The Source, Billboard and The Washington Post.